Retül Fit enables riders to maximize power, endurance, and comfort regardless of the type of riding you do. During your personal Retül Fit session, our trained specialist will assess your individual needs and systematically tailor your bike position and equipment to your body. Whether you are just starting out as a rider, or a seasoned professional like one of our Race Team members, having a poor Fit will greatly affect the quality and enjoyment of your ride. While there are many fitting services to choose from, Retül Fit is the most comprehensive Fit system available to all riders, regardless of experience level or even the brand of bike you choose to ride. It goes beyond the basics offered by competitors, and is an individualised, scientifically proven system focusing on all aspects of a rider's position. For both Road and Mountain Bikes a fit session is a personalised, one-on-one consultation with one of our professionally trained, qualified and enthusiastic Retül Fit Specialists. What happens during a Retül Fit session? Our Retül Fit Specialist will talk with you about your riding history and aspirations, which will help us fully understand you. We will also cover if you have any concerns about your current bike position, aches and pains you get whilst riding, or specific medical conditions (only if they need to be mentioned and are affected by your cycling). This is followed by a 20 point physical & flexibility assessment where we will look at your body's structure, neutrals and any limitations/ extremities you have in particular areas. Your trained Fitting Specialist will utilise the 15 point Retül Fit protocol to assess your riding from a side-on perspective, followed by a frontal analysis. Every part of the bike will be looked over in order to optimise your comfort, increase your performance and reduce the risk of injury, from Saddle Height to Saddle Fore/Aft, and Cleat Position to Pedal Spacers! The adjustments we make will be done in line with the knowledge we have accumulated from the Pre-Fit assessment of your body's neutral positions, its extremities and your goals and needs of the bike. This means that none of your body's limitations will be exceeded, which will increase and prolong performance and will delay fatiguing, along with setting the bike to suit your chosen experience of riding. After your session, your specialist will arrange a Follow-Up appointment approximately 6 to 8 weeks to discuss your adapted position and to answer any questions on concerns you may have. 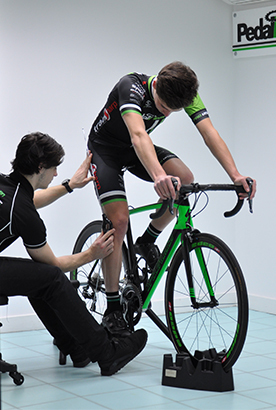 We will talk about, and make any further adjustments that could be made to improve your bike fit. Let us know what you like about the adjusted position, and definitely what you feel needs further adjustments. Sometimes we make some substantial adjustments to your bike in the original fitting session, so your body can have made some adjustments to flexibility, core strength etc. This is when more bike adjustments can be done to accommodate to finalise the optimised position for the long term. From here there is no need to book any more appointments, but your Specialist is always here for any more advice in store, via email, or simply call for a chat! Our State of the Art, specific Bike Fit room is fully equipped with multiple HD Cameras, technical software, and is a quiet, immaculate environment to perform the perfect Retül Fit. We use one of the quietest Turbo Trainers on the market during the riding, so both the Rider and Fit Specialist can have a conversation without shouting. Using a turbo trainer also makes the Retül Fit a Dynamic Process, rather than Static. This is beneficial due to being able to see real-time specifics in the riding position which are caught on the Slow-Motion Live HD Cameras and stored for your personal viewing and records. During our Bike Fits, we utilise the incredible Retül products, like the Müve Dynamic Fit Bike with the HD Cameras to ensure the most precise results of fitting and quality. Both of our Specialists are knowledgeable, enthusiastic and are fully qualified, to deliver the best fitting service for you! Do you have any other queries or questions regarding Retül Fit? Please do not hesitate to contact us at bgfit@pedalheaven.co.uk, call 01252 628575, or pop in for a chat! All of our staff members are very knowledgeable on the Fitting process, and can answer any questions you may have. Book your Retül Fit session with us today! So if you have made the decision that you do want to be faster, more efficient, and more comfortable on the bike; book a Retül Fit with us today! We look forward to greeting you and starting a great relationship between Customer and Specialist, to aid your cycling for years to come!